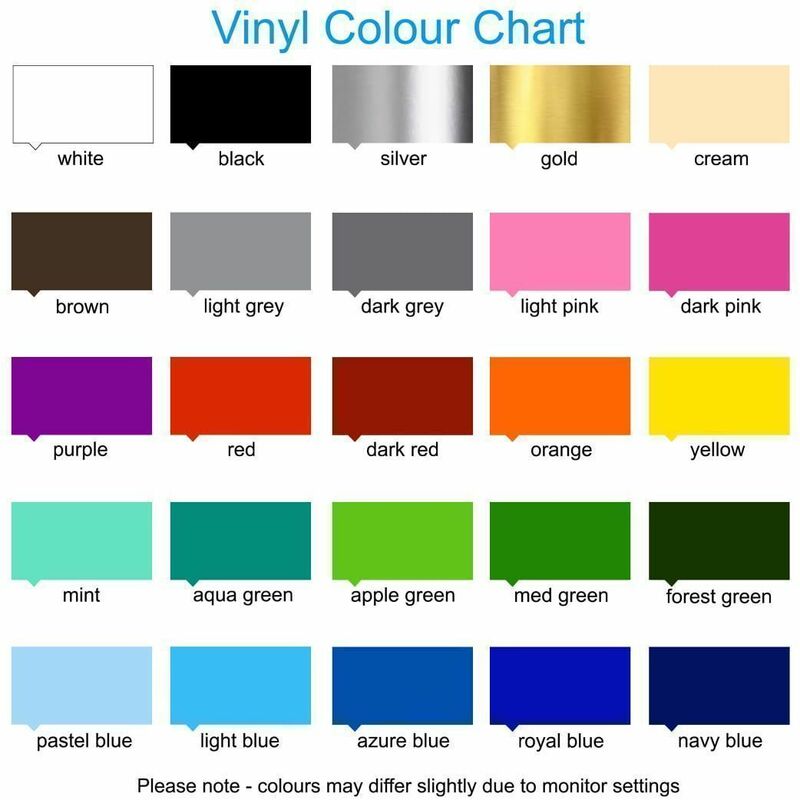 Please use the drop down boxes below to select colours. Do get in touch if you want to vary the colours even further and I will be happy to help. Your vinyl sticker design will be supplied in three layers. 1. Make sure your surface is clean and dust free. 2. Lay down your design on a hard surface (face down). Rub over the back of the design with the card provided in all directions. 3. Use masking tape to position the design, using both top edges. 4. Once the design is in your desired position, place a large piece of masking tape across the top of the design (creating a hinge). 5. Lift the design up and starting from one corner slowly remove the backing paper. 6. Carefully lower the design to the surface and smooth it out using the card provided. Starting in the middle and working outwards to remove any bubbles. 7. Wait a few minutes then start removing the top transfer film, starting from one corner. When peeling keep the transfer film close to the surface, so you are not to add any pulling pressure. 8. Only the design should now be on the surface. It will give a brilliant effect as if it were painted to the surface. Please wait a moment for it to load, then click on arrow. I will send you an application tool free of charge to fit your wall art. What is a vinyl wall art quote/sticker? 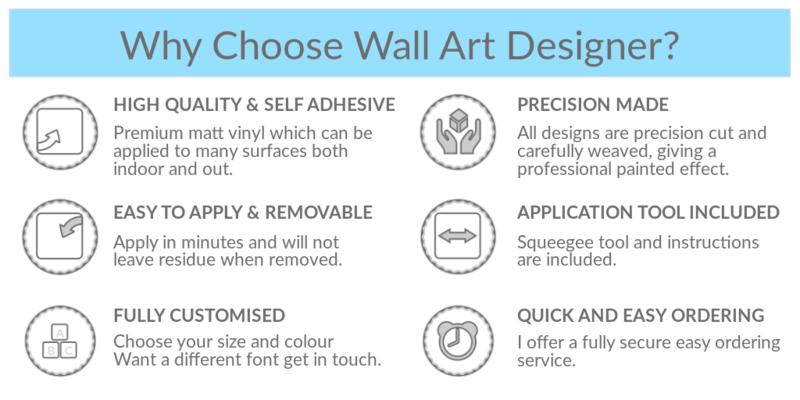 A vinyl wall art quote is a low tac sticker/decal that can be applied to most surfaces and when applied it is said that they look professionally hand painted. (The stickers do not look like stickers) All my work is precision cut using only the best quality material. I offer a wide range of beautiful colours and the endless possibility when it comes to the words and design of your wall quote. Are the wall art quotes easy to apply /fit and remove? Yes they are. I provide full fitting instructions with every order. You can also see my instructions and video via my 'Application & Removal' button. Can I apply / fit the vinyl to the outside of my boat or caravan? Yes for sure! You can apply/fit the vinyl both indoors and outdoors. The vinyl is very strong and ideal for boats, caravans, vehicles and many more surfaces. You can save on money by fitting the name or quote yourself, because they are very easy to apply/fit. I have just painted my walls how long should I wait until I apply my wall quote? 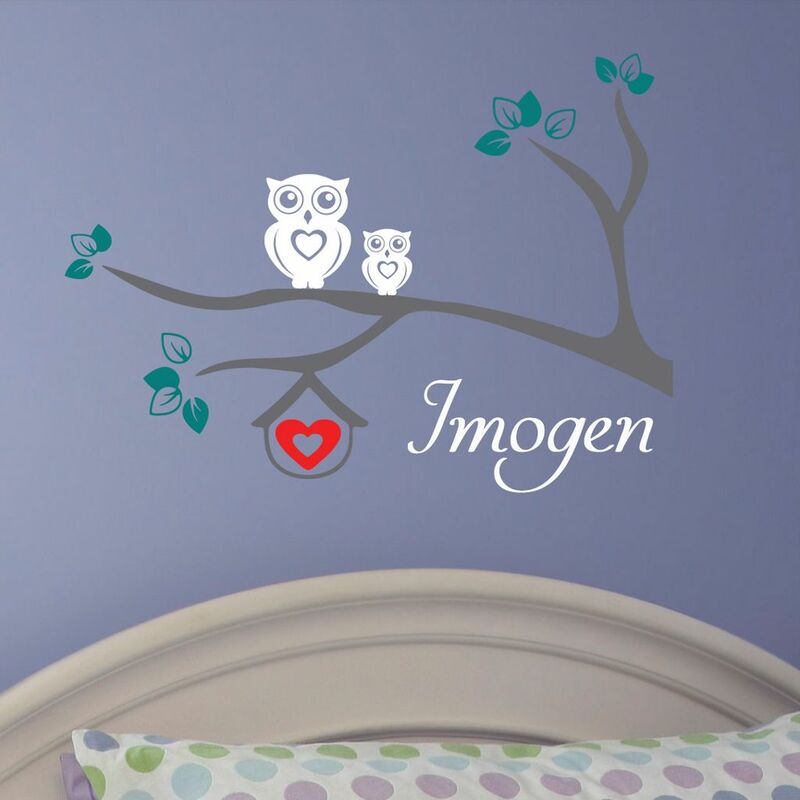 It is recommended to wait 2-3 weeks to give the paint plenty of time to dry and harden,this will then allow the wall art quote to stick. Please note, even though it often says on a tin of paint that the paint is dry after several hours or a day, this does not mean that it is fully hardened. Can I exchange/refund if I am not happy with my wall art quote? Yes of course! All I need you to do is return it within 14 days in the same condition. Upon receipt I will send you a replacement or issue a refund if required. The original shipping cost will not be refunded unless the product was faulty. Please note orders that are personalised/custom cannot be refunded. However, if I am at fault and goods are damaged or have an error I will happily offer an exchange or replacement. After placing an order how long before I receive my vinyl wall art?I aim to have all orders dispatched within 1-3 working days. I use the Royal Mail, first class service, so please allow 3-5 working days for my UK customers. For my overseas customers delivery will range from 7-14 days depending on your location. Will your colours match my decor? 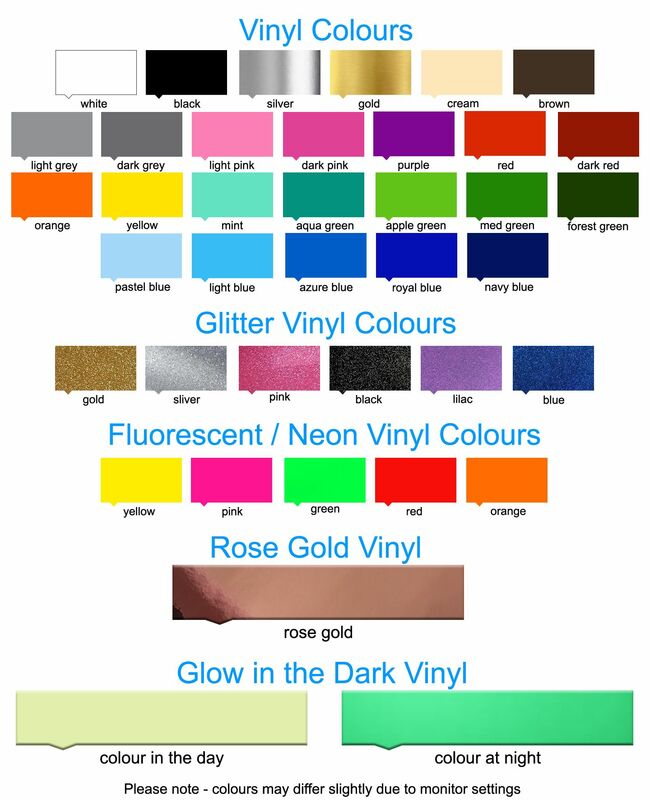 Please message me via the 'contact Gemma' button and I will be happy to send you a free colour sample of your choice. 1. Pay online with your credit/debit card. 2. Pay online using your PayPal account. 3. Pay online using Amazon pay. 4. Pay by bank transfer. 5. Send me a cheque. 6. If you're local you are welcome to come to my office and pay by cheque, postal order or cash.